If anybody wondered why star journalist Mundo Carrasco would stop investigating Mazatlan's drug lords and politicos in order to run the shady new puppet mayor's press relations, then they had never been to bed with the scorching, amoral, monumental Mijares. Mazatlan's huge, blaring Carnival became the greatest time Mundo had lived since his days as a local baseball hero: access to the real power and closeted skeletons, a political future of his own, and...mostly...the perfect flesh of Mijares. Then the mayor beats up his wife, the city government starts to unravel into scandal and panic, and they start killing people--with Mundo right up there on their list. Tumbling through the tumult of Carnival, mob violence, narco suites and wretched bulldozed hovels, musical mayhem, his own corruption, and three women who want to reclaim his soul for his own good and their own purposes, Mundo is either sorting himself out or getting totally mixed up...if he comes out of it with his damaged scruples and bruised hide intact. 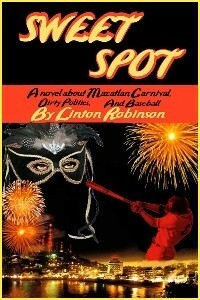 Author Linton Robinson is a veteran, award-winning journalist and author of several popular books on Mexican culture. His work is very much affected by the decades he lived in various parts of Mexico and Central America. "Sweet Spot" is a valentine to the eight years he lived on a hill right above the throbbing heart of Mazatlan's carnival celebration, wrote for local newspapers, and hung out with the local musicians, athletes, cops and criminals.